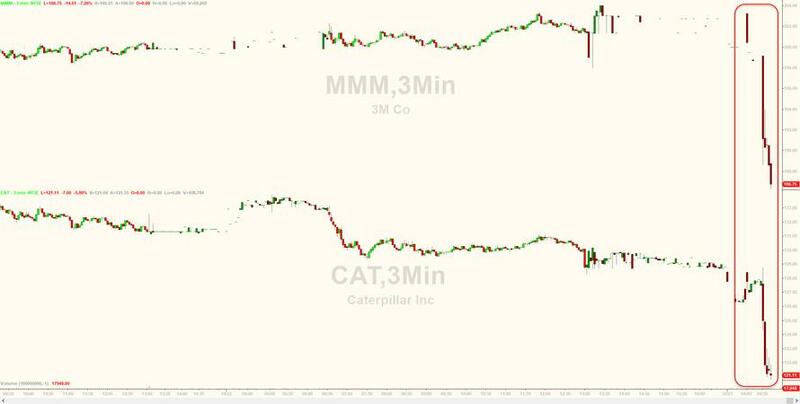 The earnings disappointments continue with CAT and 3M the latest to add to fears about "peak earnings" after 3M not only missed Q3 earnings but slashed its full year EPS guidance, while CAT warned about rising material and freight costs. Starting with 3M, the multinational conglomerate reported 3Q EPS $2.58, which while a 10.7% increase Y/Y, missed estimates of $2.70 on net sales $8.15 billion, also missing estimates of $8.40 billion. 3M reported operating cash flow of $2.1 billion, almost was almost entirely handed over to shareholders, with $794 million paid in cash dividends and $1.1 billion in stock repurchases. On a geographic basis, core results were ok with sales growing 1.6% in Asia Pacific and 1.3% in the U.S.; however, total sales declined 3.9% in EMEA (Europe, Middle East and Africa) and 5.5 percent in Latin America/Canada. The top-line was ugly: industrial net sales were $3.02 billion, increasing 2.2% in local currency terms but down 2.1% after the foreign currency translation. Operating income was $667 million, a decrease of 0.7 percent year-on-year; operating margins were 22.1 percent. Healthcare revenues of $1.45 billion were even worse, down 2.8% in U.S. dollars. Electronics and energy sales were $1.4 billion, down 4.8% in U.S. dollars. Consumer sales were $1.2 billion, down 3.4% in U.S. dollars. But the biggest disappointment was the company's guidance, which now sees full year adjusted EPS of $9.90 to $10.00, below the consensus est. $10.28, and down versus the prior expectation of $10.20 to $10.45. The cut reflects an estimated full-year earnings headwind of $0.05 per share from foreign currency versus a prior expectation of a benefit of $0.10 per share. Separately, Caterpillar reported Q3 results which beat on adj EPS $2.86, vs the estimate $2.85 and revenue $13.5 billion, also above the estimate $13.31 billion. But while earnings were strong, what traders were worried about was the company's warnings that “manufacturing costs were higher due to increased material and freight costs," adding that "Material costs were higher primarily due to increases in steel prices and tariffs." Specifically, CAT said that the impact of recently-imposed tariffs was about $40 million in third quarter, and the company sees full-year impact of the tariffs at the low-end of $100 million to $200 million range. The company warned that its manufacturing costs were higher due to increased material and freight costs, primarily due to increases in steel prices and tariffs. CAT also cautioned that the ramp in demand, with sales and revenues for the first nine months of 2018 up 24 percent, has led to supply chain “challenges” across the industry. CAT also notified dealers of upcoming price action of 1 to 4 percent worldwide on machines and engines with exceptions on specific products and regions. 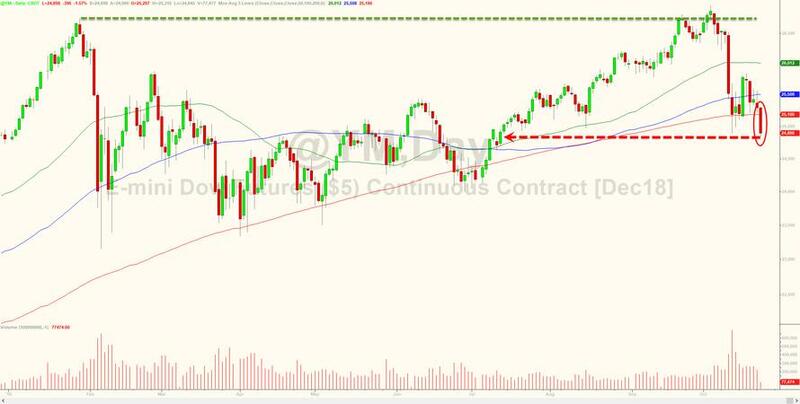 "This price action will be effective in January 2019, and is a result of current industry factors and general economic conditions." 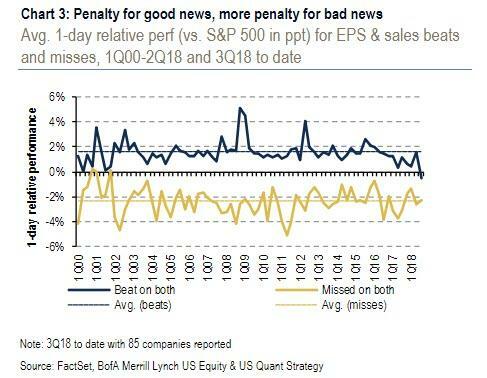 The price drop despite an earnings beat was covered yesterday in "Stocks Are Doing Something They Haven't Done Since The Dot Com Bubble", in which we noted that for the first time in 18 years, the average stocks is punished after bearing earnings. Also hitting CAT stocks was the company 2018 EPS guidance, which while in line with the prior range of $11.00 to $12.00 adjusted, with the lower range of that forecast falling short of the $11.65 EPS estimated by analysts. As Bloomberg's Andrew Cinko writes, "the spark for the renewed selloff comes from Caterpillar and its decision not to raise its earnings outlook, another confirmation that peak global and earnings growth is behind us." ... and the two key Dow members are dragging the Dow Jones even lower, with the industrial index now down over 400 points in the pre market.